These cherry cobbler cupcakes feature two fresh pitted cherries baked right into a brown sugar lemony batter. In a medium-sized mixing bowl, beat brown sugar and butter until fully combined. Mix in lemon extract and milk. Fill cupcake liners ¼ full. Note that this will not use all of the batter. While the batter is baking, roll the pitted and de-stemmed cherries in a bowl of corn starch and sugar until the cherries are fully coated. Remove cupcake tin from the oven and place two coated cherries on top of the partially cooked batter in each cupcake liner. Divide remaining batter evenly among the cupcake liners, covering the cherries. The batter will come nearly to the top of the cupcake liners. 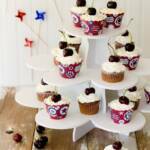 Top each cooled cupcake with fresh whipped cream and a cherry.